Editor’s Note: The April FLCAJ magazine is the Management Company Special Issue. The management company profiles below are a great introduction to several management companies that would love an opportunity to lead your community with excellence. AKAM On-Site serves South Florida’s premier luxury properties. With attention to every detail, we bring a rare combination of industry knowledge, professionalism, and flexibility to every association we service. For more than 35 years, AKAM has been committed to maximizing property values and enhancing the quality of life for our clients. For more information about AKAM On-Site Inc., visit AKAM.com. TOP TIP—Clear delineation of association responsibilities allows the association to optimize the use of board, committee, and volunteer resources. 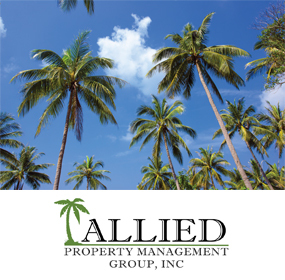 Allied Property Group is a full-service property management company providing service to South Florida since 2003. We understand the challenges faced by the board of directors to maintain low costs, increase property values, and enhance the community experience for their fellow neighbors. Our experienced and talented staff can help you achieve those goals by helping you save time and money. You will find that we genuinely care about your community and its goals. 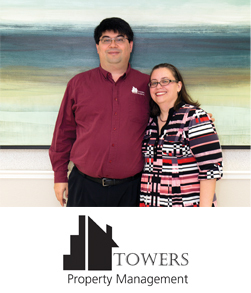 We provide a personal touch to increase positive relationships with our board members and homeowners alike. Our team consists of licensed community managers with extensive experience in the industry, dedicated property accountants, and a qualified customer service staff. Together our team has the tools and skills they need to help you make the best decisions for your community. We are a technology-focused firm, which allows us to provide outstanding customer service while being efficient. Our team works closely with the board of directors to run efficient meetings, generating comprehensive and easy-to-read financial and management reports. TOP TIP—It is important that associations establish and implement an effective maintenance and risk management program. Not only can this help reduce costs, but also it helps preserve some of the association’s most expensive components. 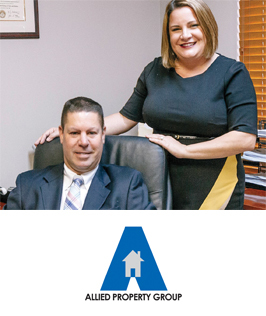 For the past 15 years Allied Property Management Group has been serving condominiums, co-ops, and HOAs in the South Florida market. The company is continually on the cutting edge of introducing new industry-leading technology and providing a transparent experience for both boards and homeowners. It also offers access to time saving and convenient online tools and account information. AlliedPMG is a full-service property management company providing portfolio as well as on-site managers, full bookkeeping services, technology solutions, maintenance staff, and all compliance and administrative functions. As a boutique-styled company, AlliedPMG provides services throughout Palm Beach, Broward, Miami-Dade, and Martin counties and continues to strive to provide top tier service, guidance, and advice to clients through a direct involvement ownership approach. 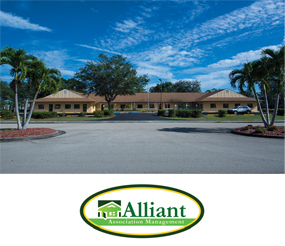 For more information on Allied Property Management, call (561) 214-4517 or visit www.alliedpmg.com. recognition available to community association managers—you can trust that your Associa team has the knowledge and resources to help your community plan, manage, maintain, and grow. From our community managers and service partners to our financial professionals, executives, and support staff, we are committed to helping you achieve your community’s vision. To learn more about Associa, visit www.associaonline.com. 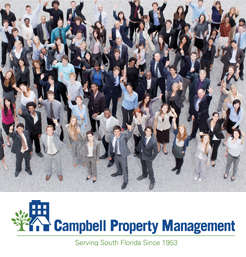 Founded in 1953, Campbell Property Management is South Florida’s highest-rated community association management company and one of the largest and most experienced, locally-owned property management companies in South Florida. With five fully-staffed offices and more than 700 full-time employees, Campbell serves more than 350 associations in Broward, Palm Beach, Martin, and Port St. Lucie counties. Their management services include administrative, financial, accounting, maintenance and janitorial, valet and concierge, social director, gate access, human resources development, community websites, information technology, and landscape maintenance. Castle Group offers a distinctive management approach throughout the states of Florida and Texas that is flexible and customized to meet the needs of your community. Castle’s association management team provides a complete array of services to operate the administrative, financial, physical, and people aspects of your community association. We have organized our company around supporting the operations of the on-site teams. 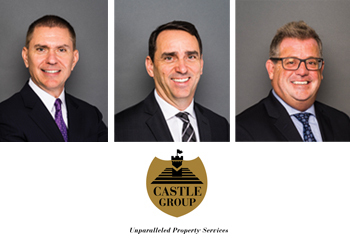 Castle Group’s core purpose is to be proud of everything we do; our vision is to enhance the lives of our team, customers, and the community through the provision of unparalleled property services. 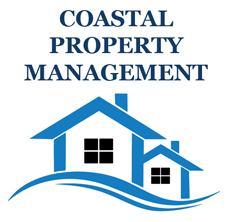 Coastal Property Management was created to assist community associations that need professional and personalized property management services. We specialize in condominium and homeowner association management, providing our clients with peace of mind and an unmatched level of dedicated service. Our company is locally owned and operated. Our relations with our clients are based on personal service, good communication, and attention to detail. We serve North Palm Beach County, Martin County, and St. Lucie County. TOP TIP—Communication through a community website helps to keep your owners engaged and interested in their community. For more information on Coastal Property Management, call (772) 600-8900 or (561) 781-8030, email Info@cpmfl.com, or visit www.cpmfl.com. Elite Property Management is a pro-active, results-oriented comp-any specializing in the management of condominium and homeowner associations and commercial and developer-controlled properties in Pinellas, Hillsborough, and Pasco counties in West Central Florida. They have achieved success by offering outstanding service that far exceeds the expectations of their clients by providing each community with highly individualized and specialized attention, tailoring their services to fit the specific needs of the community. For more information on Elite Property Management, call (727) 400-6850, email wendy@elitepms.com, or visit www.elitepms.com. 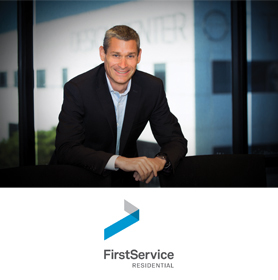 Founded in 1990, FirstService Residential is North America’s largest manager of residential communities and the preferred partner of HOAs and community associations in the U.S. and Canada. In Florida alone, FirstService Residential manages more than 2,000 community associations, consisting of low-, mid- and high-rise condominiums; single-family homes; master-planned communities; lifestyle and active adult communities; and rental and commercial properties. The company also specializes in working with complex communities that have large budgets and offer numerous amenities to their residents. As a complement to property management services, the company offers banking and insurance, financial management, developer services, concierge services, energy management, procurement and value engineering, technology solutions, and a customer care center ready to assist its residents 24 hours a day, 365 days a year. TOP TIP—Review contracts annually. Take a close look at all of your vendors, contractors, and service providers and identify opportunities to negotiate discounts or enhance services. 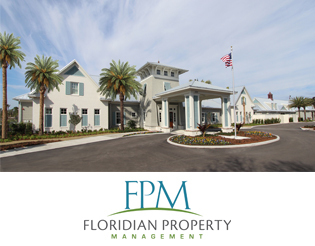 Floridian Property Management specializes in providing community management services throughout Florida. 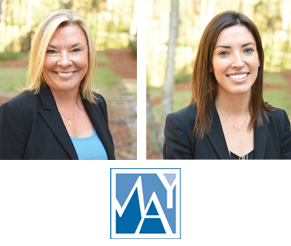 Our staff has extensive accounting, finance, real estate, and community management experience. We are dedicated to providing sound financial management and unparalleled customer service. We commit ourselves to being courteous, friendly, and understanding of the investment each homeowner has in their property and community. We strive to maintain the character and value in each community we serve. TOP TIP—Our commitment to you is to always be courteous, friendly, and responsive to your needs. For more information on Floridian Property Management, call (904) 592-4090 or visit floridianpropertymanagement.com. Smaller by choice, Greystone Management is committed to providing personalized services based on the needs and desires of the board of directors, committees, and owners in a community. Our phones are answered by our friendly staff during office hours, and we provide live after-hours response service for after-hours emergencies. Greystone supports the board of directors by relieving their involvement in the day-to-day operations and helping to develop a philosophy for enforcement and maintaining standards for each community. All management and support services are provided by our experienced managers and staff at our Maitland office. For more information on Greystone Management Company, call (407) 645-4945 or visit www.greystonefl.com. KW Property Management & Consulting provides full-scale property management services to homeowner associations and condominium boards. KWPMC delivers operational precision, hospitality with a personal touch, outstanding financial reporting and accounting controls, and flexible and efficient technology solutions—all distinguished by a dedicated and committed staff that aims to enhance the experience of every association we serve. We’re privately owned, with a hands-on approach that involves our founding partners and executive team assigned and engaged with each and every property. Our well-trained staff delivers elite service to our growing list of prestigious properties. We take great pride in building lasting relationships with associations and boards that share our commitment to excellence. We Don’t Just Manage, We Enhance. TOP TIP—Creating committees within your community is a great way to engage owners and develop a pipeline of future board members. For more information on KW Property Management & Consulting, call (954) 815-8321 or visit www.kwpmc.com. In 1981 Harry C. Powell, Jr., PD, created Landex Corporation, which was ranked 50th in the top 100 of Fortune 500 businesses throughout for over 10 years. 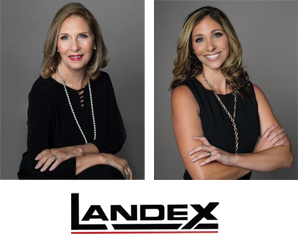 Landex Corp. began specializing in timeshare management and telemarketing and grew into both a CAM firm and real estate firm. Ruth Anglickis, PD, worked with Mr. Powell at Lehigh Corporation from 1962 to 1981, where she helped form 125 clubs and organizations. Many of the associations she helped to develop while working for Lehigh Corp, Landex Resorts still manages today. She and Mr. Powell will celebrate 56 years of working together this year. Robyn Rocco, VP, oversees the corporate office and its managers. She has helped obtain special designations for the properties, such as Green Lodging Certification for our timeshare, and has set up most other properties to receive incentives for Leadership in Energy Efficiency programs. 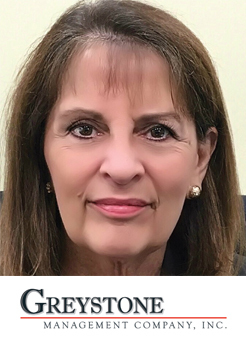 Robyn adds her qualifications to the CAM firm by holding a Florida Real Estate License and Florida Community Association License since 2009. For more information on Landex Resorts International, call (239) 369-5848 or visit www.landexresorts.com. 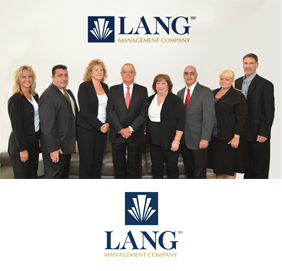 Lang Management Company, founded in 1980, has been a leader in the management of homeowner, property owner, and condominium associations along the Gold Coast. Lang’s tenured staff is comprised of dedicated professionals with the resources and a network of experts to help identify and solve property management challenges quickly and effectively. With portfolios of communities ranging from 10 units to more than 5,000 units, Lang Management adapts to client needs by providing customized property management services. Board members are free to choose only those services that meet their needs. Our professional and affordable management services include comprehensive financial reporting, technologic-ally advanced systems, risk management services, customized website services, and emergency preparedness and disaster recovery programs. In-house professionals and strategic partners include a repairs and maintenance affiliate, janitorial service contractor, landscape architect, certified arborist, licensed aquatic weed control specialist, and irrigation and pest control contractor. TOP TIP—You choose the perfect place to live because it reflects the type of lifestyle you most enjoy. Shouldn’t your property management company help protect that investment? 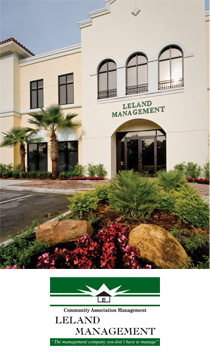 Leland Management is a leading community association management firm that has been managing Florida condominium and homeowners associations for more than 20 years. We have 16 offices located throughout Florida and currently manage more than 400 associations ranging in size from fewer than 100 homes to approximately 4,000 homes. Leland is a full-service management company with seasoned professionals who pride themselves in providing the best quality service to the communities they serve. We have more than 90 licensed community association managers who carry numerous advanced professional designations, and we have an effective system for sharing this expertise within the company and with our communities. Although Leland is large enough to have all the resources necessary to meet the needs of any association, Leland is family-owned and -managed. We understand that building solid, long-term relationships is very important to the quality of our services and success of our company. TOP TIP—Choose your management company carefully. You want to make sure you work with a company you can have a great relationship with. We know your community association is more than simply board members and meetings. It’s a community, it’s a family, it’s a home; that’s why RealManage strives to provide more than basic management solutions. 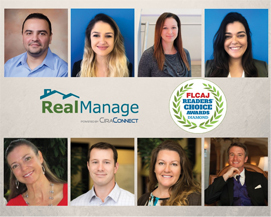 As one of the nation’s most prominent HOA and condominium management providers, RealManage is committed to delivering the most comprehensive and innovating solutions while continually exceeding client expectations. Our local management teams prioritize communication, transparency, and support to ensure your community thrives. Backed by world-class proprietary software and a best-practices services platform, RealManage has earned a distinction in our industry for providing customized, scalable technology solutions without losing our hands-on personal approach. The RealManage operating history goes back more than 30 years through our various acquisitions and branch operations and is now one of the top five community management companies in the nation. We have maintained a sharp focus on creating a unique advantage for your communities and associations and look forward to helping support your board in the future. Offices in Tampa, Orlando, and Port Charlotte are ready to serve you. Sentry Management was founded in 1975. We have grown to be one of the largest homeowners association and condominium management firms in the U.S., with our headquarters located in Florida. 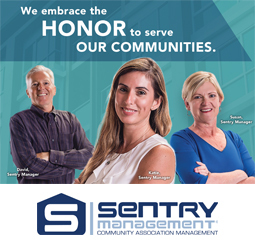 Sentry exclusively focuses on managing communities, homeowners associations, and condominiums. With 15 Florida offices, Sentry is a major presence in the state. Sentry is an Accredited Management Organization (AMO®)—an assurance of integrity and expert financial systems. Only the top six percent of U.S. management companies earn this prestigious designation and only a handful of association management firms. Sentry has no ownership or affiliation with any HOA or condominium contractors or suppliers. We always negotiate the best prices for each community we manage, and the savings come back in the form of lower operating costs to residents. Integrity and transparency are part of our DNA. Planning and coordination of association meetings, site visits, enforcement of deed restrictions, contract supervision, and aggressive collection of assessments are all regular services, along with detailed financial and manager’s reports. Sentry invests heavily in technology and tools to help communities prosper. Since 1975, Seacrest Services has been a leader in community association management. From full-service association management services and professional accounting services to complete landscaping, maintenance, and janitorial property needs, we can tailor a specific plan for your community association or commercial property. We take great pride in the longevity of our client relationships and our customers’ continued satisfaction. With more than 40 years of experience, Seacrest draws on its depth of knowledge and its highly trained and certified staff to ensure the highest levels of customer satisfaction. 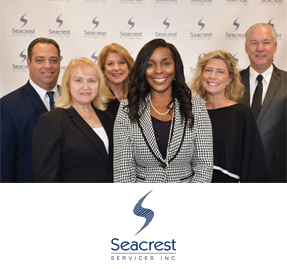 With offices in West Palm Beach and Pompano Beach, Seacrest Services is uniquely positioned to handle the needs of South Florida’s community associations, commercial properties, and businesses. TOP TIP—When reviewing your association accounting services, make sure you have the proper checks and balances in place. This will help foster a positive and productive environment. Communities are built around people. Our encompassing and attentive team works to construct a community in which individuals can prosper. Sovereign & Jacobs, a full-service association management company, provides innovative and creative solutions to challenges, incomparable accounting, and administrative expertise aimed to enhance the value of your property. With organized and responsive service, each partnership is treated with care and detail. Our integrative design of action, supported by 25 years of industry experience and success, focuses on developing an intimate and productive client relationship. Committed to delivering specialized attention to your community needs, the personable nature of our management sets us apart from competitors. Established with integrity, Sovereign & Jacobs’ goal is to establish functional management tailored to your association’s needs. For more information on Sovereign & Jacobs, call (800) 262-2874 or visit www.sovereign-jacobs.com. 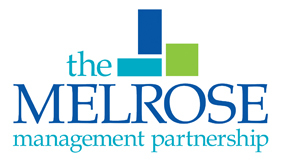 The Melrose Management Partnership, led by CEO Jack Hanson, is a leader in modern community and lifestyle management. For more than 25 years, Melrose has provided professional on-site and portfolio management for some of Florida’s most desirable neighborhoods. Specializing in a wide spectrum of housing alternatives, including single-family and multi-family communities, condominiums, office condominiums, and townhomes, our organization prides itself on having solid insight into the needs and concerns of each individual association we serve. Our distinction from other management firms is simple: Melrose exclusively combines the full-service accounting, technology, and depth you expect from a larger firm with the personalized touch and layered management support that smaller firms provide. At Melrose, we believe that achieving excellence in community and lifestyle management requires an organization that makes a commitment to quality, service, and integrity. We bring an approach that is interactive and inclusive in an effort to promote full disclosure and open communication with all of our clients. We have fine-tuned our practices to ease the burden of day-to-day management on your board of directors. TOP TIP—Don’t lower your standards to accommodate an unresponsive or underperforming management company. Working with a company that meets or exceeds your standards is paramount for achieving excellence! Founded in 1989, Vesta Property Services has worked tirelessly to provide unmatched services to community boards of directors and residents. Quickly becoming Florida’s first choice for community management, Vesta has regional offices located throughout the state of Florida, employing more than 1,200 professionals providing a wide spectrum of services to more than 250,000 residents and unit owners. Vesta Property Services specializes in providing the ultimate management services to condominium associations, planned communities, active-adult communities, and commercial properties. The Vesta Difference: Vesta is not just a community management company. We are also an amenity management company, providing lifestyle services such as pool services, spa and wellness services, food and beverage operations, special events, theatre operations, and more. 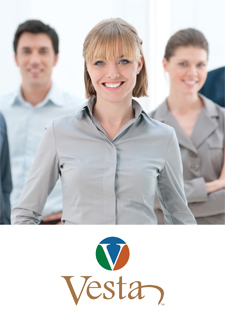 In addition to all of this, Vesta’s Financial Services Division offers financing, comprehensive financial tools, fiscal management, low closing costs and expert strategic planning, and consulting services. 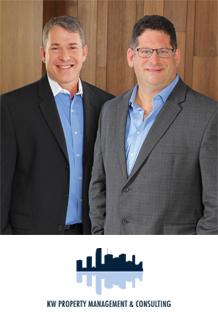 “We don’t have any boundaries to what services we’ll provide our clients. I don’t know any other company in Florida that’s doing what we’re doing,” says Frank Surface, CEO, Vesta Property Services. TOP TIP—Your community is unique, with unique needs. Chose a full-service association management firm that caters to your individuality and offers solutions and best-in-class service to ensure your association runs perfectly. For more information on Vesta Property Services, call (877) 988-3782 or visit www.VestaPropertyServices.com. 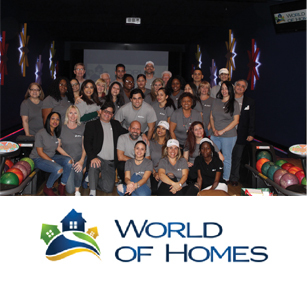 World of Homes is a family-owned and -operated multi-functional real estate comp-any which provides community association management, developer construction management and transition, as well as real estate and property management. In addition to holding five industry awards, they celebrated 25 years of dedicated service to the Central Florida area in 2018. While offering all standard management services, their focus is on the people who make up the communities they serve and their dedicated staff. TOP TIP—Partner with your community association management company and work as a team to educate your homeowners on the benefits of your association.